Just wanted to say thanks! Dex did great at Thanksgiving, even with unexpected guests and no e-collar at my parents’. My mom wanted to learn how to walk him properly and he was a perfect, submissive gentleman on and off leash. Dexter came to training and shortly became one of our most extreme cases to date. 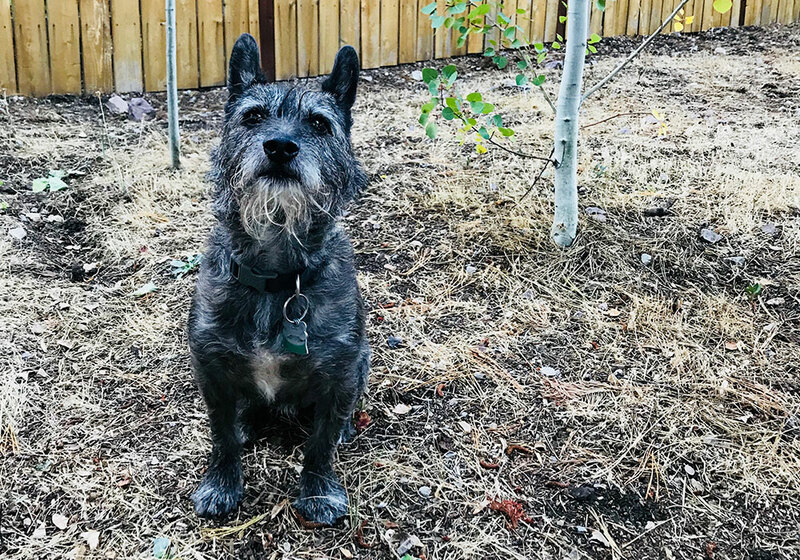 Dexter had several challenges: human and dog aggression, growling/showing teeth, nuisance barking, no recall, pulling on leash, food aggression, possessiveness. He was also very hyperactive, had bitten his owners, strangers and neighbors, was manipulative, and had a strong fear of abandonment, and was even possessive of other dog’s owners at dog parks. Dexter’s litter was abandoned and split up at 6 weeks old, which was when his owner took him in. He was aggressive and would hurt himself escaping being crated or baby gated into spaces. This was the owner’s first experience with owning a dog and did not socialize him from an early age. Blair picked up Dexter, had a good first interaction and rode up to the mountains quietly. Once in crate in Blair’s home, he threw his first big tantrum. First thing was to teach Dexter that his crate is his calm place and quiet space. Once accomplished and a relationship had been established, Blair took Dexter outside to start the training. The first two weeks of training went well, Dexter didn’t like being touched, and Blair had to manipulate training with leashes the first 5-7 days; and then warmed up enough to touch and he was able to put a collar and leash on Dexter directly. When the owner’s showed up for their Guest Home Stay in Mt. Shasta, Dexter turned into a very different and defiant dog in their owner’s presence. He had an instant power surge with their presence and Dexter took it to the extreme. Acting out, not listening, throwing tantrums, and Blair knew he needed Dexter longer for training and delayed the guest home stay by 4 weeks, giving Blair a full 8-10 weeks of training with Dexter. At the next guest home stay, Dexter showed extreme behavior again but Blair was able to keep it under control. Blair even allowed Dexter to stay in the guest home overnight with the owners since that is where the issue was. Training the next day went well with owners: Blair was able to work with Dexter and taught the owners everything they needed to know which went back to the basics – these new dog owners were very committed to the process and caught on quickly. They learned how to physically and mentally provide for Dexter; including what a dog really needs as to what they think Dexter wants; utilizing the Primal Hierarchy of Needs. After a successful weekend of 15 hours of hands on training, Dexter went home with his owners. First week: Upon returning home after training, Blair showed up within 24-48 hours for the first in home session to transition Dexter back into his home environment. Everything was going well and Blair instructed them on what to do the next three weeks during reintroduction training. Problem: the owners got a little too excited, they jumped the gun on off-leash training before Blair was able to return for this three week in home follow up visit to further instruct which caused a problem on their walk in downtown Sacramento. One Month: The problem was that the owners forgot some training and were not utilizing Dexter’s electric collar properly to effectively communicate. Rather they were utilizing the collar for corrective based communication only. Blair was able to walk them through their off leash downtown Sacramento fiasco over the phone, immediately came back for a visit and started introducing other games for training to further enforce Dexter’s electric collar and proximity issues. They first started off with a 30 foot lead leash, then graduated to a 45 foot and then 60 foot lead to desensitize Dexter’s proximity issue with the e-collar and for the owners to use it more effectively – this training was enforced for the next three weeks. Three months: Blair was able to come back for the last in home visit and everyone was working and communicating well with one another. No more issues needed to be addressed at this time.